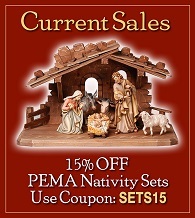 This is the most popular woodcarved nativity style produced by PEMA carvers. There are over 135 individual figures, including sheep, shepherds, elephants and farm animals. Kostner Tyrol Nativity Sets - 4 OPTIONS! Kostner Root Nativity Sets - TWO OPTIONS!